Posted on Wednesday, January 29th, 2014 at 6:45 am by Pieter van der Westhuizen. The WiX Toolset provides a number of standard actions that are sufficient for most installers. If, however, you need more flexibility over the installation process the WiX toolset provides custom actions. In this example, we’ll write a simple custom action that will prompt the user to enter their product registration information. If this information is valid the installation will continue, if not, the installer will exit. This project will create a custom action project that contains a CustomAction.config and CustomAction.cs file. For this example, we’ll focus primarily on the CustomAction.cs file. This code will cause the license information form to be shown once the custom action is invoked. If the user clicks the Cancel button on the license information form, the custom action will exit by returning ActionResult.UserExit. If the user enters the license information correctly and clicks the Next button, the custom action will return ActionResult.Success. Since, we want to display a dialog to prompt the user to enter registration information, we first need to create the user interface. 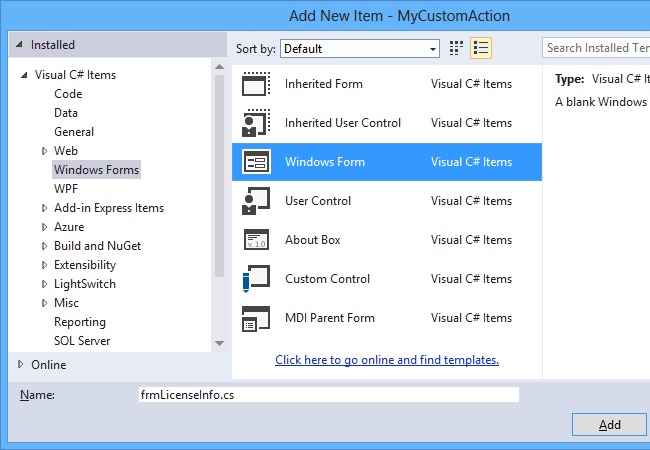 Start by adding a new Windows Form to your project. Select the form in the Visual Studio forms designer and set its CancelButton to the name of the Cancel button, in this case it is btnCancel. This will ensure that when the user clicks on the Cancel button the dialog result of the form will be returned as Cancel. The above code will enable visual styles for the form as well as make it the top-most form. If we do not set the TopMost property to true, the form will be hidden behind the standard WiX UI. The code will first check whether the registration information has been completed and then call the VerifyLicenseInfo method. This method is used to validate the registration information and can either connect to a licensing server or run a license key algorithm to make sure the user has entered a valid product key. The Binary element must point to the DLL file that is generated by our custom action project. You’ll notice that we add .CA.dll to the end of the custom action projects’ target name. This is because the custom action project generates two DLL files. The DLL that ends in .CA.dll contains a format that is callable from the MSI engine and this is the file we need to reference. 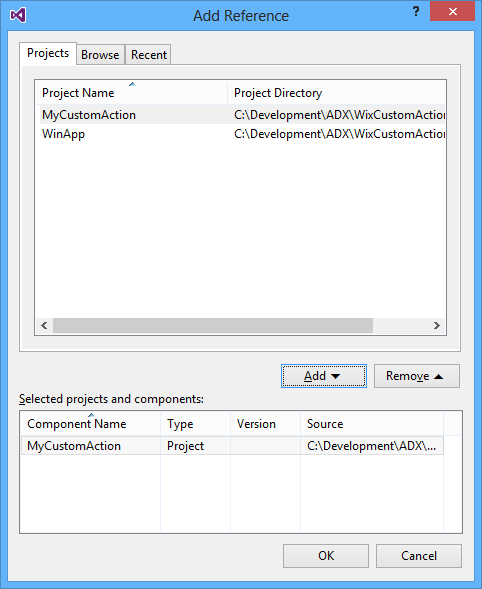 In the Add Reference dialog, select the Projects tab and add the MyCustomAction project to the list of selected projects and components. The CustomAction element is used to specify the custom action we’ve created. The BinaryKey attribute points to the id of the Binary element we’ve added earlier and the DllEntry attribute should be the name of the method in the custom action that ought to be invoked, in this case set it to ShowLicenseInfo. 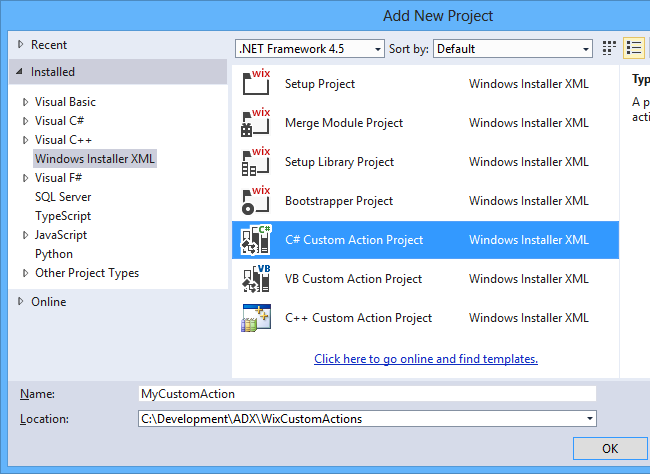 The above code specified that the custom action should be run before the InstallFinalize installation step. By setting the element value to NOT Installed, we told the WiX installer to only run the installation when it is not already installed, thus it will not run when the user uninstalls the application. 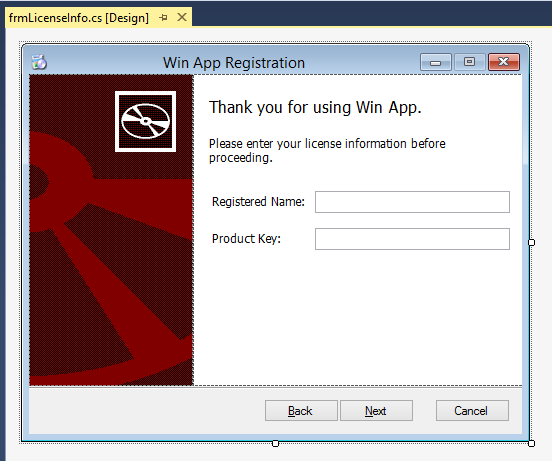 After building the solution and running the MSI, you ought to see the license information form just before the installation finishes. thanks for this tutorial. That will help me to develope “my” custom dialog during installation process. Your licenceInfo dialog result is the click of the cancel or next button. I’am planning a list of CheckBox items in “my” dialog to let the user decide, which application he wants to install. How can I get his decision from the dialog window into the WIX project? How can I handle this information in the WIX code? It sounds like you want the user to choose which feature to install. I wouldn’t recommend you use a custom action for this. Rather, have a look at the FeatureTree UI that the WiX toolset provides – this gives the user a UI to choose which feature to install. You can use this by adding each application you want to install as a feature in your installer. I would like to ask how to do the feature tree and user able to select which feature to be un-installed instead of whole application. I’ve not had to build a setup that allows removal of only certain features yet, although I’m sure it would be possible. This might not be a bad idea for a future blog post. Besides, Hope you can create more interesting article about WiX Toolset. to display list of prerequisite software that was not installed on target computer during set-up installation. (I don’t want use condition message and display the error message one by one). You may email to me for further discussion. Unfortunately, I’ve never had to display a list of prerequisites in a list box using WiX, so I’d have to do some research. Thanks for the article. It is very useful article. Due to this article, I completed my installer project. Thanks for your article.I have a question here, is it possible to install some other applications, like 7-zip or some.exe(non msi package) in some step of the wizard process? I want the installation to be behind one of the wizard dialogs, not after the “Finish Dialog” showing, the installation begin itself. I think this might be what you’re looking for. Pieter, appreciate for your reponse, I’ll have a try. Thanks again. I want to get msi installation wizard inputs given from User using wizard of MSI. How will be able to get this given inputs and stop installing msi. I am getting the following error. i know this is an old post but if you are still active here, I would really appreciate a reply. The system cannot find the file ‘C:\Users\Shreyas\Desktop\AlignNET_FileUploadSrv\AlignNET_FileUploadSrv\CustomerInfoAction\bin\Debug\CustomerInfoAction.CA.dll’. We cannot help you with this issue as it obviously doesn’t relate to the demo project described in this blog. There are too many ways to get this error; I simply unable to list all possibilities. I have create a Custom Action in the same way. It works fine but the problem is when I show my Window Form using “showDialog()”, this window is not modal which could be a problem in the installation process. I have checked your example and there is the same “problem”. Have a look at https://social.msdn.microsoft.com/Forums/windows/en-US/bbe69f12-8908-4c65-aa89-1963720d4c11/windows-forms-wont-appear-on-top-of-setup-project-window?forum=winformssetup. I followed your tutorial but when I use the msbuild command to build it I had the error “Undefined preprocessor variable ‘$(var.MyCustomAction.TargetDir). Find the complete msbuild output at http://temp.add-in-express.com/support/sample_msbuild_output.txt. To produce the full output, modify the main project; say, change its version.